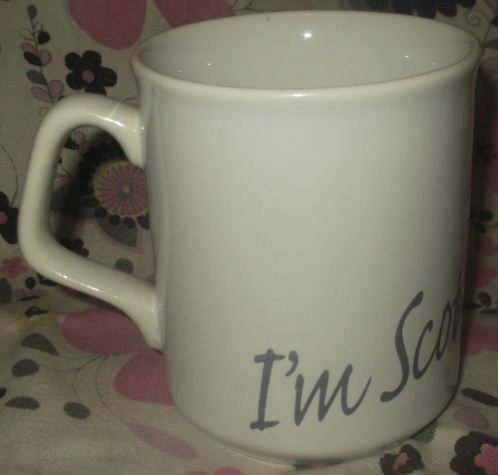 I must admit we are occasionally gifted earthenware without any back-story or by your leave, and so I set about tasking the Mugspotters Research Team to trawl the net and trace the brand or organisation responsible for bestowing their earthenware trinket on the working public. This time however, we are defeated, nay deflated, as well. We’re stumped. 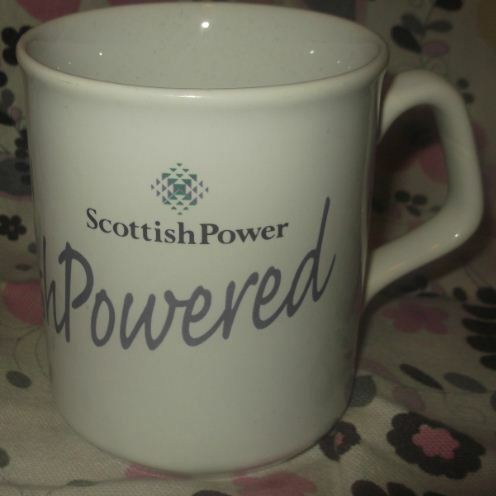 No end of searches on the name or strapline returns anything that sounds vaguely associated with where I believe it was salvaged from, which was the Utilities Arena. And so we are left with this top-heavy, 2-colour on white Sparta. I so wanted to give this ‘John Doe’ the write up it so truly deserves. 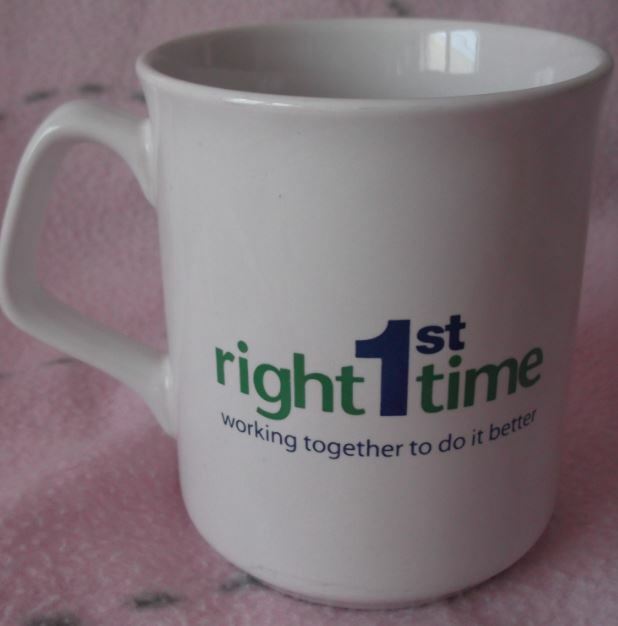 I can only hope someone visits our humble site or Twidder account, recognises this brand or organisation and kindly furnishes us with some more details. Rest assured, as soon as we hear anything, you, our dear Spotters, will be the first to know. I wasn’t looking forward to posting this. It’s quite difficult to say anything positive or vaguely witty about energy companies these days so I won’t start now, suffice to say in the 5 minutes it takes me to write this entry any of the major players in this racket will probably have made £17,000,000,000 profit and then think it would be a good thing to increase our energy bills by 6% this quarter! After a flurry of exotic and unusual earthenware in recent weeks there’s nothing quite like the ‘White Bread’ Sparta to bring us crashing back down to Earth. 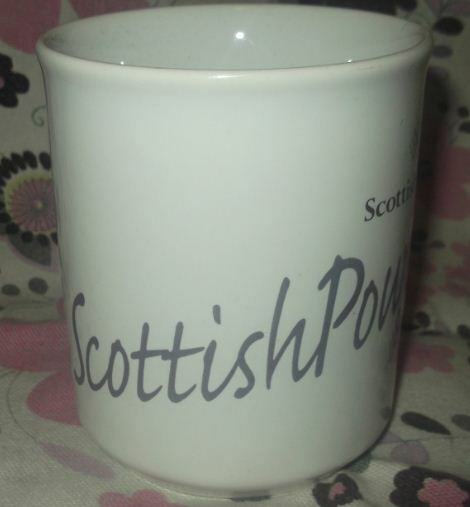 The mug itself is nothing out of the ordinary but the slogan “I’m Scottish Powered” is wrapped around its circumference with a logo nestled on one elevation. We may get round to posting a video of this one day but until then please check out the 3 shots below which capture all angles.